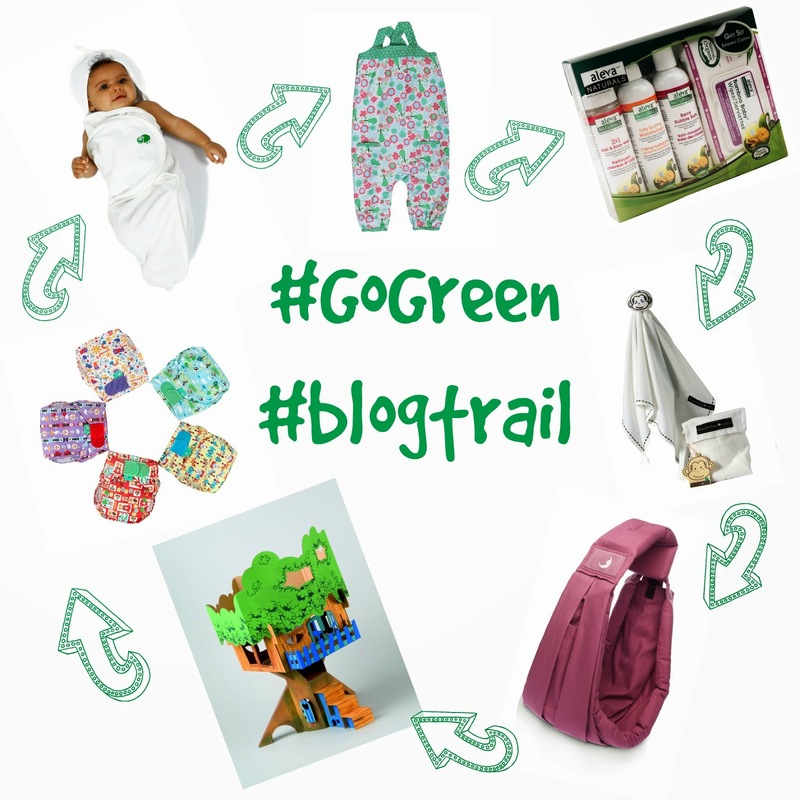 Today I have a fantastic giveaway, and an opportunity for you to win a set of 5 Tots Bots Cloth nappies, a Baba Sling, a voucher for Frugi, and Aleva Naturals gift set, a Calafant paint your own treehouse, a cocoon towel and a drool monkey! We first discovered cloth nappies when Dylan was only 2 months old and have been a convert ever since. Our very first purchase was a Tots Bots Cosmic and since then we have collected different prints and watched the nappy evolve into the V4 that are currently on sale. I had two children in cloth nappies for nearly a year and it was the ease of use and the fact that the nappies fitted both boys that made it so easy. 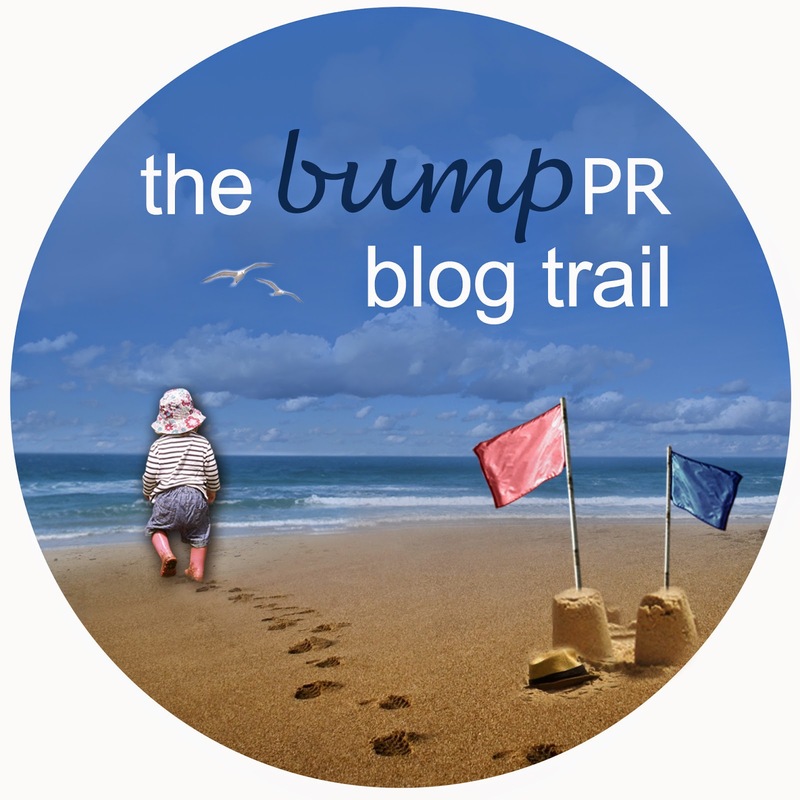 Bump PR are running a Go Green Blog Trail and I am thrilled to be giving away a set of 5 Rhyme Time print Easyfits. 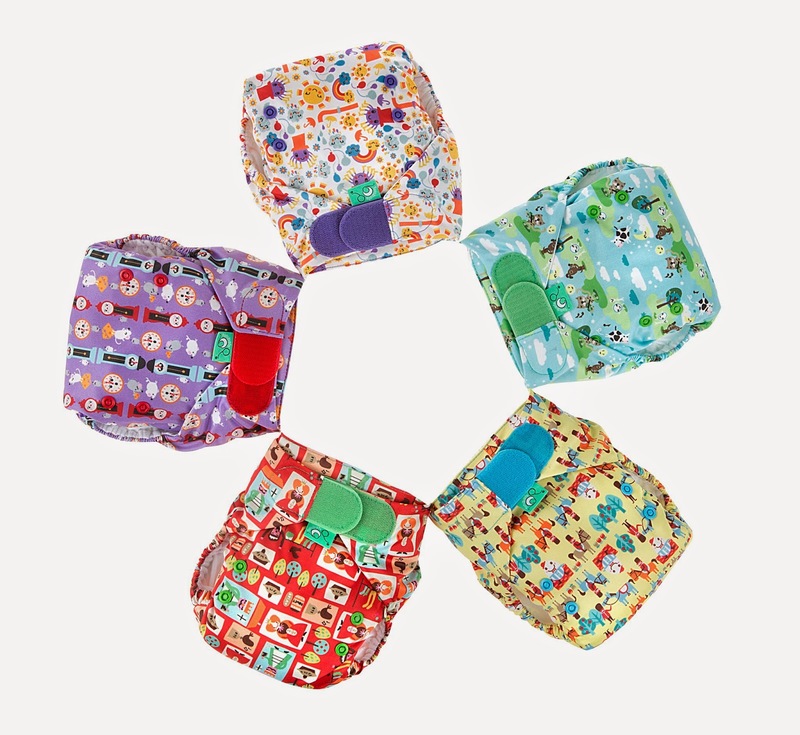 These birth to potty nappies fit from 9lb through to 35lb and are so easy to use that I can truly describe them as dad-proof. The bloke has never once messed one up, but often dresses the children (and himself) in back to front and inside out clothing. These gorgeous 5 prints would look perfect this summer on a little bum, and on the warmest days I let the boys explore in just a T-shirt and one of their lovely Tots Bots nappies. To win a set of five Rhyme Time Tots Bots Easyfits worth £79.99 please use the simple rafflecopter form below. follow this to the next blog. I love the Hickory Dickory Dock. ! The blue and green one! Can't think of the name right now! I love them all, but Incy Wincy is my favourite! Love the blog, by the way. I love them all, but especially hey diddle diddle!!!! Hey Diddle Diddle is my favourite but Incey Wincey is a close 2nd. So cute. I love them all but hickory dickory dock stands out the most to me. I like the grass and trees one, seems appropriate for today. We have a couple of floral TotsBots. I love that they dry so quickly. Forgot to say! I'm torn between hey diddle diddle and incy wincy spider. Love a bright nappy cover. I love all of the tots bots prints but (running a rodent rescue) hickory dickory dock is my favourite at the moment. Love Tots Bots! Looking forward to trying their 4.0. I have a few of the older prints but I really like the look of Hey Diddle Diddle. Hey diddle diddle for sure! Incy Wincy is my favourite! Love them all, but incy wincy spider definitely my fave! Ooooh I adore them all! But I would say hickory dickory if I had to pick just one, I love the colour. Hickory Dickory Dock is my favourite... it's the rhyme that calms our little boy down when he's cross about being removed from his bath! I love the rainbow/sunshiney design! Hickory Dickory Dock, partly because it is purple! It's a tough call because they're all really cute but Incy Wincy Spider just edges it for me! I like the blue and green one - is that Hey Diddle Diddle? I love the purple clocks design as its the most girly of all the colours! love the incy whincy spider one!